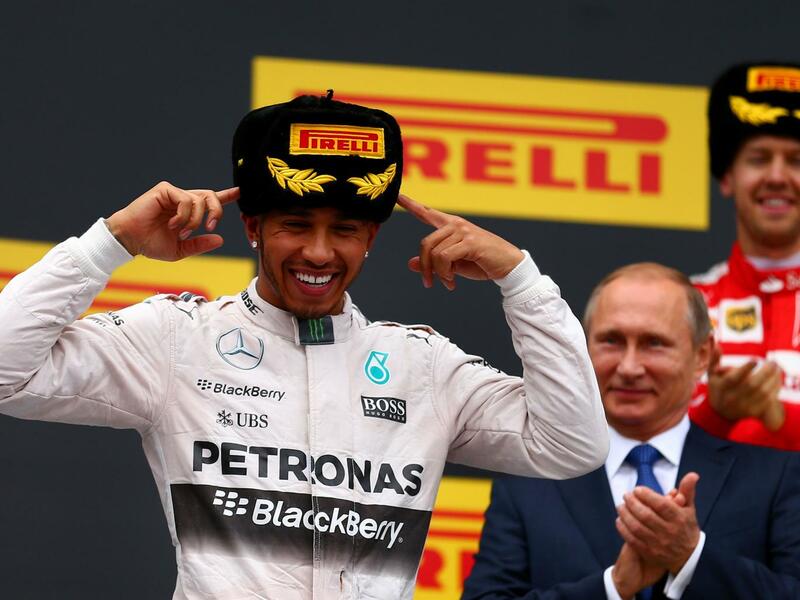 Leading to the Rusian GP the only winner of the new circuit remained the favourite to keep that title – even when Lewis Hamilton missed out on finally claiming his 50th pole position for the second time in a row, tipped to the spot by his Mercedes team-mate, the memories of the first-lap overtake in Suzuka two weeks earlier suggested the reigning champion was still very much up for another race win. With nothing to lose at this late stage of the championship Nico Robserg pushed for the fastest time in qualifying and carried on pushing when the lights went off on Sunday afternoon. 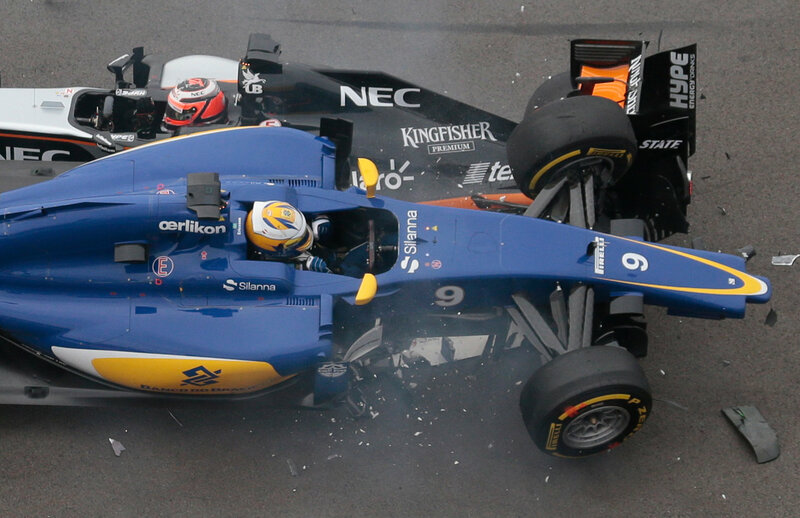 Unlike in Japan, he managed to defend the position against charging Hamilton on the first few corners, and then the safety car was called due to a collision down the pack, which sent Force India’s Nico Hulkenberg and Sauber’s Marcus Ericsson out the race. 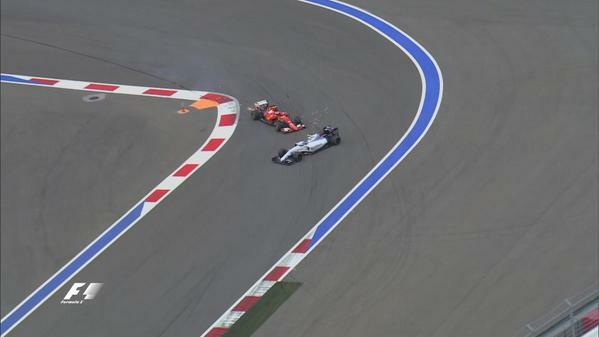 The first-lap collision between Hulkenberg and Ericsson kickstarted the afternoon of crashes at Sochi. A few laps later, the pursuit restarted, but it didn’t last; as early as lap six Rosberg began to complain about a broken throttle, and was overtaken by Hamilton minutes later, to eventually retire on lap eight. That opened the way for the Brit to shoot out to a comfortable lead and claim yet another victory, extending his championship lead to 66 points and virtually ending Rosberg’s 2015 title campaign – more so that the German has dropped down the standings, making room for his countryman Sebastian Vettel. The four-time champion continues going from strength to strength – as proven by his commanding (over the rest of the field) second place finish in Sochi. In fact, Hamilton has recently said he hoped Ferrari would raise their game next season to provide more excitement for F1 fans – in the form of an outright battle between himself and Vettel, with whom he currently shares a tally of 42 race wins. With these two firmly dominating their designated podium-scoring positions in Russia, one needed to look a further 22sec behind Vettel for a bit more action – and that was, indeed, where it all happened. 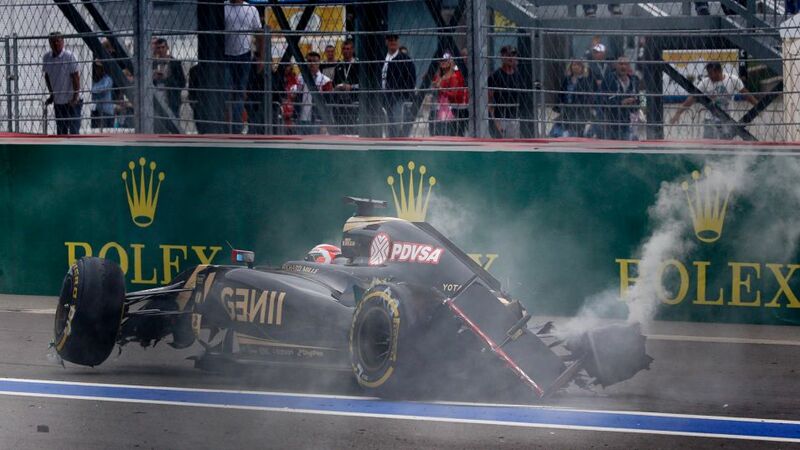 Grosjean added to his tally of crashes in the Lotus before his departure for the new Haas team in 2016. Following another great qualifying result placing him just behind the Mercs on the grid, Valtteri Bottas looked likely to finish the race where he started; he was close on Hamilton’s tail after a second safety-car period on lap 16, following Romain Grosjean crashing his Lotus into the barriers, and held his ground against Vettel’s pursuit. But when a quickly wearing compound sent him into the pits for a tyre change mid-way through the race, the Finn ended up behind Vettel, as well as the remaining Force India of Sergio Perez and the Red Bull of Daniel Ricciardo. In the remainder of the race Ricciardo retired his car on the side of the track due to a suspension issue and Bottas was left with two jobs to do: overtake Perez while defending from the second Ferrari of Kimi Raikkonen, right on his backside. Raikkonen’s move on Bottas robbed Williams and Ferrari of valuable points, but brought glory to Force India and Mercedes. In the very last lap the old tires on the Force India could not carry on fighting for the podium and so Perez had to concede to the two Finns battling it out for the position – battling so hard, in fact, that Bottas ended up retiring when Raikkonen drove into the back of his Williams, sending it into the barriers. The Ferrari continued with a damaged floor to cross the line in 5. This, in turn, opened the door to Perez to reclaim the position and cross the line in 3. 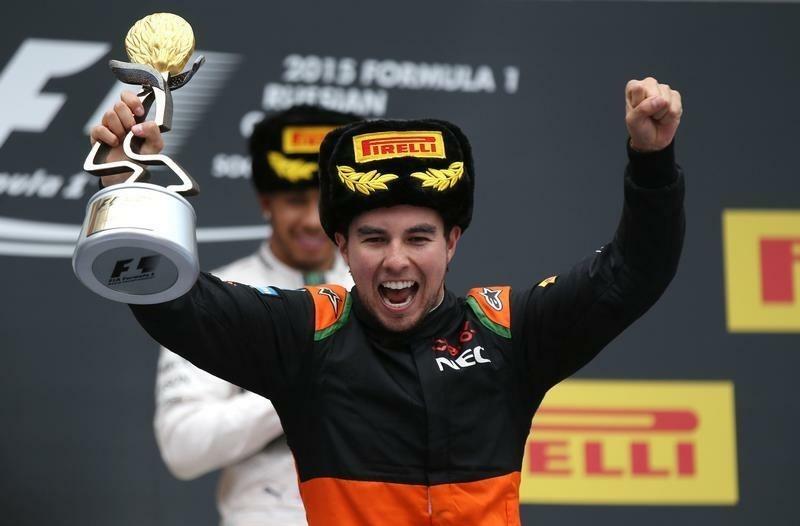 – claiming Force India’s third ever podium. “It feels great to be back on the podium and to be able to celebrate with my team,” the Mexican said after the race. “With one lap to go, when Valtteri and Kimi passed me, it felt like this result had been taken from us: I was obviously disappointed but I also knew I had given all I could during the race. There was no more I could do because I had been on the same tyres for more than 40 laps. But that was not the end to the post-Sochi celebrations, as although Raikkonen’s move spoilt the day for Williams, it also resulted in the Finn’s subsequent penalisation, dropping him to 8. which equaled a six-point deficit for Ferrari that afternoon… and therefore handing the constructors’ championship to Mercedes – even though the Silver Arrows didn’t find out until later that day. Grabbing the title was just a formality, so celebrations at Brackley started as early as Monday. 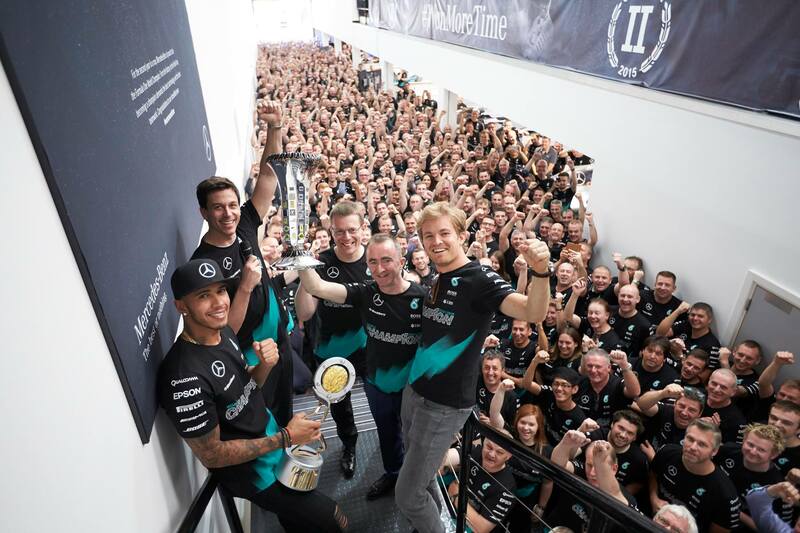 Photo by Mercedes AMG Petronas. It wouldn’t have felt like an equal success, but McLaren also had a pleasant surprise in Russia, as they managed to pull some speed out of their Honda engines, allowing Jenson Button to cross the line in 9.; his team-mate Fernando Alonso was less fortunate as he followed in 11, conceding the last point-scoring position to Toro Rosso of Max Verstappen. Like many other teams on the Sochi grid, the outfit only saw one of their drivers cross the finish line; earlier in the race Carlos Sainz retired due to a break failure – thankfully, not because of a medical condition, heaving experienced a serious shunt when crashing his car in a practice session on Saturday morning. As Formula 1 flies across the Atlantic for the final leg of the championship, it leaves only 100 points to play with for the 20 drivers on the grid – and it would take but a miracle to take the fun away from Mercedes and hand it over to the rest of the field. He’s the man: Hamilton is set to seal the deal on his third career title.